Think you can't bake on a grill? Think again. 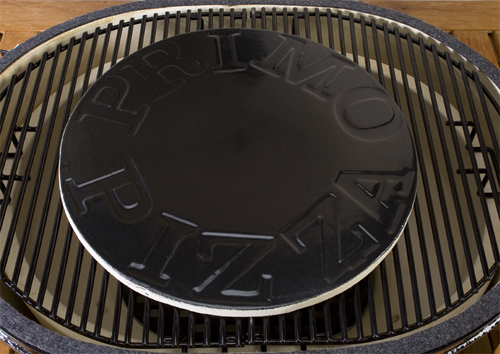 The Primo Pizza Baking Stone for Oval Extra Large and Kamado Ceramic Barbecue Grills turns your Primo ceramic grill into the perfect way to make crispy pizzas, cookies, or breads on your outdoor cooker. This ceramic stone with a porcelain non-stick glaze is designed to perfectly fit your Primo grill. Once in use, the stone helps retain the grill's heat and transfer it directly to your food in the way that baked goods require. Add a new dimension to you outdoor cooking experience with the Primo Pizza Baking Stone for Oval Extra Large and Kamado Ceramic Barbecue Grills. WARNING: Burning charcoal in this product can expose you to checmicals including carbon monoxide which is know by the State of California to cause birth defects or reproductive harm. For more information go to www.P65Warnings.ca.gov. Got my stone in the mail in good shape, and it works great! Itâ€™s made my Primo grill into a fantastic pizza oven. Iâ€™ve really been amazed at how great the pizza tastesâ€”just as good as any store-bought pizza! You can find thinner, cheaper stones to use on your grill than this one, but take it from me, they will crack after one or two uses and end up in the trash. This one is thick and has a porcelain glaze. I use it on my gas grill and can get it up to 600 degrees hot. We cook pizza on it, simulating a wood oven! It works greatâ€”no cracks yet! And the porcelain glaze makes clean up really easy. I use this Primo Pizza stone with my Primo charcoal grill. Hereâ€™s a tip: a big part of your success or failure will be making the pizza dough just right. Many of those easy-bake doughs wonâ€™t take the heat and burn. This stone works really wellâ€”you get a great crust as long as you start out with a quality yeast crust recipe.